In The Far side of the World, Dr. Maturin and his friend Mr. Martin have the opportunity to explore in the South American rain forest. The unfortunate Mr. Martin is bitten by a night ape, and here it is. 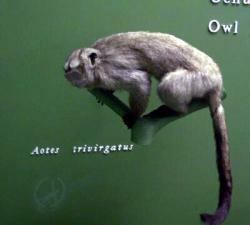 The animal that Maturin and Martin (and Cuvier and Linnaeus) call a night ape is now called an owl monkey (Aotus trivirgatus, aver. wgt. 2.2 lbs.). The word ape was at that time used to include both apes (tailless) and monkeys (usually with tails). "Owl" and "night" are modifiers describing the animal's nocturnal life style. They are the only ape or monkey to be active primarily at night. The large eyes are the give away, but because they have so recently moved from a diurnal to a nocturnal life, they still maintain their color vision. Because of the habitat and lifestyle, they are difficult to study and we still don't know everything about them. They eat fruit, leaves and insects, and form a bonded pair of male and female to raise the young. The male takes primary responsibility to raise his children, so the natural aggression of a male protecting his territory is added to the natural aggression of a parent guarding his offspring. Hence the attack on Mr. Martin.